Apulum was a fort in the Roman province of Dacia in the 2nd and 4th centuries AD, located in today's Alba-Iulia, Romania. 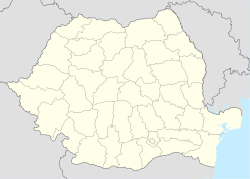 It is the largest castrum located in Romania, occupying 37.5 hectares (93 acres) (750 x 500 m2). ^ a b Schütte, Gudmund (1917). "Ptolemy's maps of northern Europe, a reconstruction of the prototypes". The Royal Danish Geographical Society. Retrieved 2013-05-04. ^ a b Domșa, Ovidiu (2009). "Virtual reconstruction of Roman military Apulum camp" (PDF). p. 6. Retrieved February 14, 2013. ^ a b "Lista Monumentelor Istorice 2010 ("2010 List of Historic Monuments")" (PDF). Monitorul Oficial al României, Partea I, Nr. 670 ("Romania's Official Journal, Part I, Nr. 670"), page 3. Ministerul Culturii şi Patrimoniului Naţional. 1 October 2010. Archived from the original (PDF) on 2012-06-10. Retrieved 2012-12-30. ^ a b "1026.01". National Archaeological Record of Romania (RAN). ran.cimec.ro. 2010-10-22. Archived from the original on 2013-12-19. Retrieved 2012-12-30. ^ a b c d e f g h "Apulum Archaeology". Retrieved 2013-05-02. This Dacia-related article is a stub. You can help Wikipedia by expanding it.